Keeping your equipment tidy while working at height is important as it reduces the risk of accidents, and it also helps in the efficiency of performing tasks. 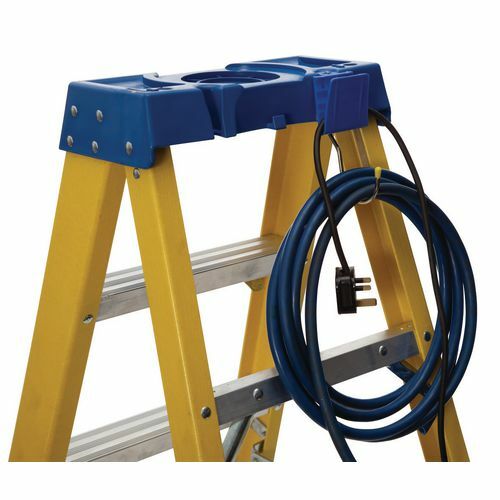 Our utility hooks are great additions to help users working at height, although many power tools are cordless now, there may be times where you will require an area to safely stow wires. The hooks hold extension cords, hoses, etc. preventing the user from getting tangled but allowing them to have safe access to the required equipment. These utility hooks suit both the industrial and trade glass fibre steps for your convenience. Please note this product is an accessory and cannot be purchased separately. To view the parent product please enter the code '385438' into the search bar at the top of the page or click the link on the right hand side. Our utility hooks are a great addition to help users working at height keep equipment accessible but safely out of the way and they come with a 12 month guarantee.